The same Al-Qaeda terrorists who fought U.S. troops in Iraq and helped NATO overthrow Colonel Gaddafi are now being airlifted into Syria to aid rebels there in toppling President Bashar al-Assad. Libya’s transitional ruling authority has agreed to send weapons and fighters over to Syria to help the Free Syrian Army fight government forces. In a separate piece, the Telegraph also reports that terrorist commander Abdulhakim Belhadj, now head of the Tripoli Military Council, “met with Free Syrian Army leaders in Istanbul and on the border with Turkey,” after being sent there by Mustafa Abdul Jalil, the interim Libyan president. A rival Libyan rebel brigade detained Belhadj at Tripoli airport for traveling on a fake passport and threatened to jail him before Jalil stepped in to intervene. “Members of the Free Syrian Army on the borders of Lebanon and Turkey denied rumours circulating in Tripoli that “hundreds” of Libyans had tried to cross into Syria,” states the article, amidst other reports that Libyans have already been detained trying to infiltrate the country from the Turkish border. As we previously documented, Abdulhakim Belhadj is the former front man for the Libyan Islamic Fighting Group (LIFG), designated as a terrorist organization by the US State Department. Belhadj was captured by the CIA in Malaysia in 2003 and extradited to Libya where Colonel Gaddafi had him imprisoned. Belhadj is a committed jihadist who fought with the Taliban against U.S. troops in Afghanistan. Libyan rebel leader Abdel-Hakim al-Hasidi also admitted that Belhadj’s LIFG fighters were the second-largest cohort of foreign fighters in Iraq, responsible for killing U.S. troops. A 2007 West Point report indicated that the Benghazi-Darnah-Tobruk area of Libya is a world capital for Al-Qaeda or mujahideen suicide bomber recruitment. Author Webster Tarpley details this intelligence in his excellent analysis piece, The CIA’s Libya Rebels: The Same Terrorists who Killed US, NATO Troops in Iraq. The West Point report detailed how the LIFG and Al-Qaeda had formed an “increasingly co-operative relationship”. Libyan rebels have gone on to impose a “reign of terror” across the country, throwing blacks in concentration camps while torturing and murdering thousands of others before imposing Sharia law. The official Al-Qaeda flag now flies high and proud above Libyan cities as armed gangs roam the streets. 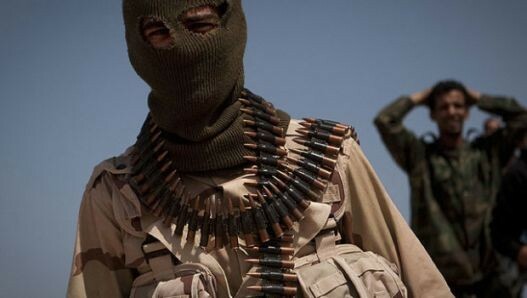 Following the fall of Tripoli, reports circulated that Libyan rebels had acquired a deadly arsenal of weapons, many of which are now on their way to Syria to aid in the overthrow of Assad. “Qatar and Turkey were reported to be airlifting “volunteers” from Libya to fight alongside the rebel Free Syrian Army, some also transporting weapons,” reports Israeli intelligence source DebkaFile. These terrorists have already been implicated in the killing of 10 air force personnel at a Syrian military base last week, even as the western media continues to characterize opposition fighters as “protesters,” just as they did with Libyan rebels who were commandeering fighter jets and firing rocket-propelled grenades. While being hailed as liberators and freedom fighters by the media, terrorists who killed U.S. troops and who are now throwing black Libyans in torture camps, are yet again going to be used as the vanguard of the next act of US/NATO middle eastern regime change, all carefully orchestrated under the smoke and mirrors of the contrived “Arab Spring”. As we reported last week, in an identical pattern to how U.S. warships surrounded Libya in the days before the NATO bombardment began, the aircraft carrier George H.W. Bush was repositioned off the coast of Syria in recent days having moved from its usual theater of operations in the Straits of Hormuz. This followed reports that Russian warships carrying sophisticated missile defense systems entered Syrian territorial waters last week as a deterrent to any NATO-led assault.